Kourtney Kardashian was seen leaving her Miami hotel this morning wearing a sleeveless black dress. The reality star was joined by her step brother Brandon Jenner, who is in town with his new wife for the weekend. Kourtney Kardashian, wearing yoga pants, a sheer black top and yellow sports bra, is spotted on the beach in Miami getting a bit of exercise. Sandwiched between her two stylists, the 33-year-old reality star can be seen doing squats and lunges as she worked on her post baby body. Kourtney Kardashian and Scott Disick were spotted taking a cruise in a bright colored speed boat in Miami, FL on September 25th, 2012. Kourtney was wearing a cobalt blue turban in which she tweeted a photo from the car stating “Turban Style. Just chic enough to embarrass @scottdisick”. So excited to reveal the shots from our Khroma Beauty shoot! Launching a cosmetics line is a dream come true for my sisters and I and we could not be more excited to share the amazing products with you guys. I just know you’re going to love them! It was really important for us that the products were of a high quality, with an affordable price point and I think you’ll all be really happy with the line. Starting this holiday season our line of luxury lash products, Lash Dash, will be available in stores, followed by many more great products in early 2013. 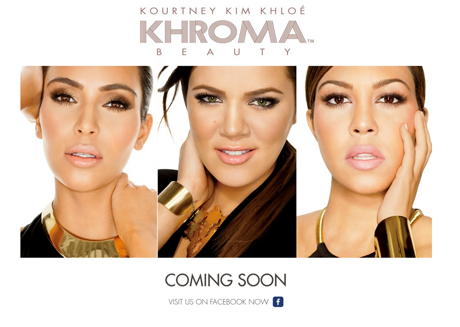 You can sign up on the Khroma Beauty website to be the first to know when Khroma Beauty goes live!! Kourtney and Kim relax on the beach in Miami on September 24. Kourtney and Mason were spotted having fun on the beach in Miami on September 21. Kourtney Kardashian was spotted leaving her hotel solo in Miami, FL on September 20th.